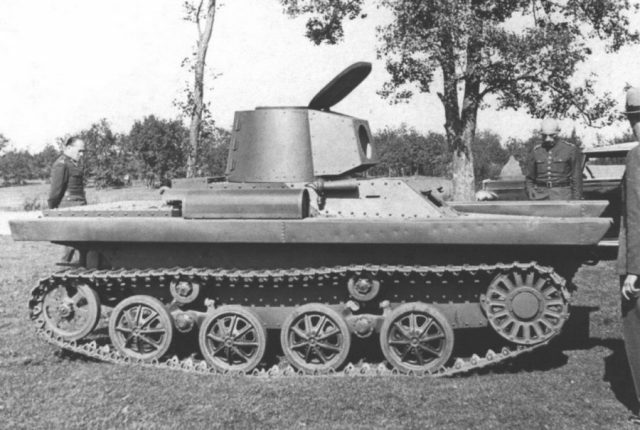 The PZInz 126 is pictured as a “what if” plan, a tank designed by the Polish engineers and meant to be built in 1940 – if the war had not happened. 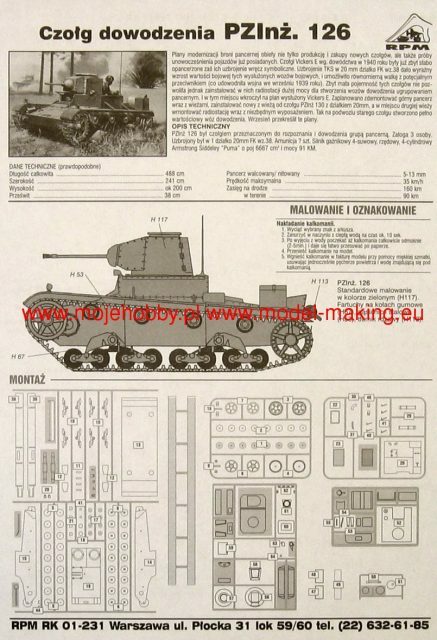 However, the model kit description doesn’t mention the fact that no plans of the PZInż 126 were ever created. The number “126” is not included in the list of PZInż projects/products. This project is not recorded in any historical documents. This tank is a fictitious invention. Unfortunately, the RPM firm has disappeared, and it was impossible to contact them for comments. The following section talks about the design of a fictitious vehicle. The information presented is inferred from the model kit description and analyzing the kit itself, along with some historical context. 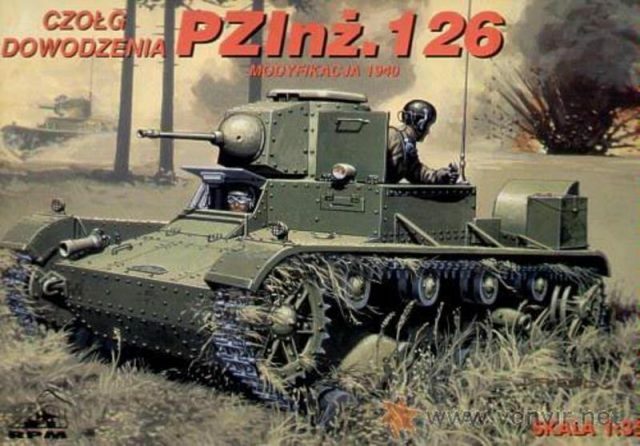 The PZInż 126 would have been a scout and command vehicle for the Polish armored formations. The crew would have probably consisted of three people, situated in the middle placed crew compartment. These were the driver on the right side of tank, the radio station operator on the left side, in place of the original left turret and the gunner on the right, in the turret. The crew is not specifically mentioned in the description, but is easy to infer from the vehicle layout. The gunner or the radio operator should have also acted as the commander. 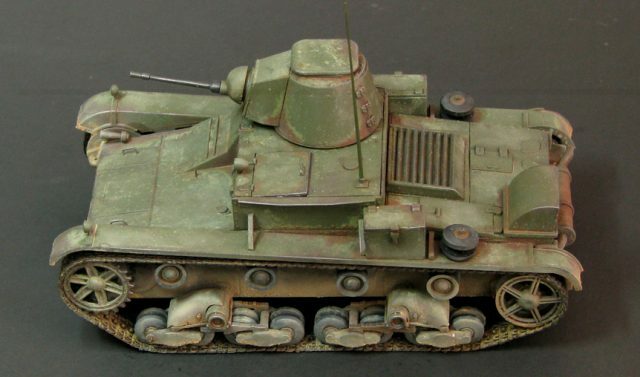 This vehicle is meant to represent a conversion of the British Vickers Mk. E Type A light tank. In 1931, Poland bought this design and started to improve its construction, leading to the 7TP. However, the Polish-built tanks had considerable improvements in construction, that do not appear in the design of the PZInż 126. The original British vehicle was powered by an Armstrong-Siddeley “Puma” engine. This engine had a capacity of 6.67 liters and a power of 91 horsepower. The Vickers tank did not have large enough air intakes, which led to problems with cooling the engine. In effect, this vehicle would have looked very similar to another tank based on the 6-ton Vickers: the Soviet HT-26 flamethrower tank. On both vehicles, the right-hand turret was changed with a new one, and the left-hand one was removed. 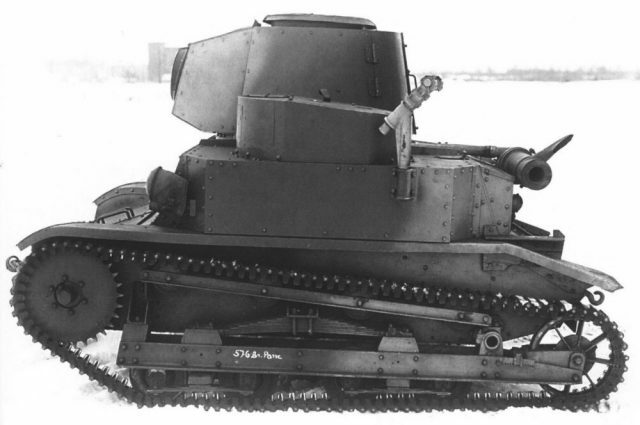 The turret would have been derived from that of the experimental TKW tankette. That turret was also used on another prototype tank, the PZInż 130. It had a top hatch and two rear doors. The turret would have contained the only weapon of this vehicle, a 20 mm gun. In the model kit description it is identified as the NKM wz.38 FK-A light cannon, but the model and the illustrations seem to represent the Solothurn S18-100. This gun had a shorter barrel and was placed lower in the turret than the NKM wz.38. The wz.38 gun was never mounted in this turret, although it was planned for the PZInz 130. Another model kit shows this gun mounted on the TKW, but this is also a fake. The place of left turret was taken by a hatch, periscope, antenna and the radio stations. The radio type is not mentioned. The idea of a vehicle that is meant to house a unit commander and provide him with mobility and protection while also allowing him to control his troops is a tested and verified one – German command vehicles, like the Sd.Kfz.265 or Pz.Bef.Wg.35(t), were very useful for the Panzer Divisions. However, in order to make use of a vehicle analogous to the German Panzerbefehlswagens, the Polish army needed a change in structure. Such vehicles were highly useful inside the German Panzer Divisions, which were dedicated tank units. The Polish army, on the other hand, perceived tanks as infantry support weapons, split into small units and working in close cooperation with the foot soldiers. The infantry command structures also had control over the Polish tanks. Thus, tanks meant as a liaison between other tanks (like the PZInż 126) were redundant. The Polish engineers did start a project to design a tank with a powerful radio, but this concept was not perceived as essential. The main Polish vehicles used for mobile long-range communications were trucks, but the idea of wireless equipped command tanks was not totally foreign. However, there was a problem. The wireless sets that could have been used in these command tanks were rather weak and did not have a long range. The first Polish tank equipped with a radio was the French Renault TSF – a converted Renault FT with a radio set inside a large box-structure on top of the hull instead of the turret. In 1926, the Polish engineers swapped the French radio sets with Polish ones with a range of 20 km. In August 1931, all the TSFs were reworked to normal FTs. Before 1936, a single Renault FT was equipped with a radio set as an experiment but unfortunately, there is no further information available about this particular conversion. 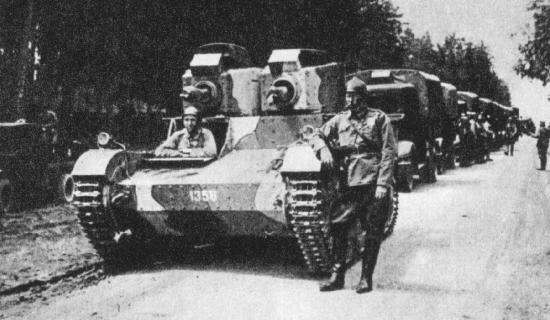 After 1936, the Polish Army equipped a few TK3 and TKS tankettes with short-range RKBc radio sets. These would have been operated by the vehicle commander. Nevertheless, these vehicles were not meant to command other tankettes, but to keep in contact with the local headquarters and possibly relay scouting information. 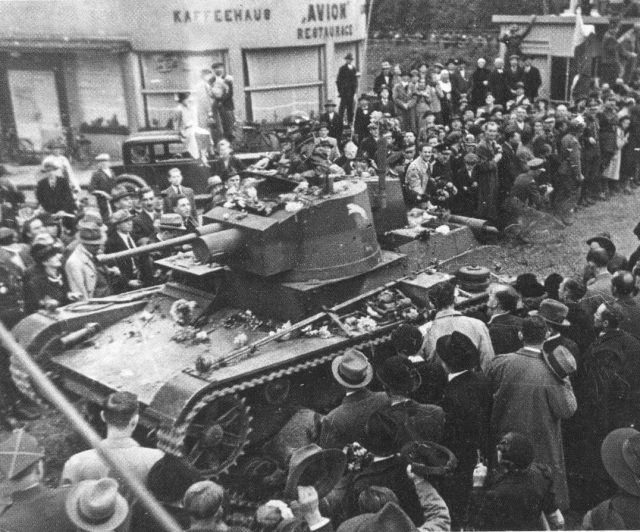 In September 1939, Poland had around 50 TKS tankettes. The number of tankettes with the RKBc radio set is unknown, but it was at least 5. 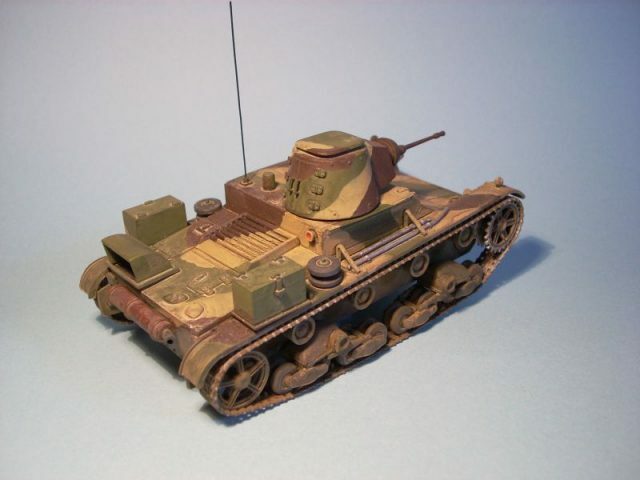 Converted tankettes are easy to identify; they had two boxes with accessories on the back (left and right sides) of the hull and a long antenna. In 1936, one Vickers E (twin turret; number 1359) was converted to carry a large radio set as an experiment. However, when the new single turret 7TP version, which had a radio set, appeared, the radio-equipped Vickers Mark E project was rejected. The intended prototype was never equipped with a radio set. 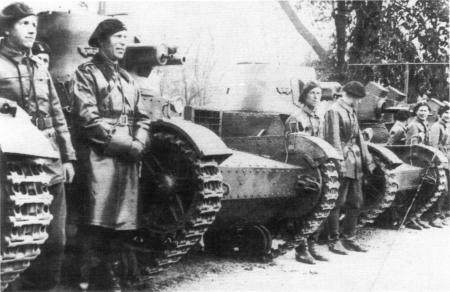 In 1938-1939, four Vickers E Mark A tanks were converted into radio vehicles (probably with the type N2/C radio set). These vehicles had a big antenna with two brackets on the hull. The specifications of this type of vehicle are unknown. However, the Vickers Mark B (single turret), which were issued to commanders, had low-power Marconi SB4a radio sets. The first page of the PZInz 126 instruction sheet.